A portable car dash mount makes a lot of sense for several reasons. Most obvious is that it’s always a good idea to avoid pasting anything permanently to your vehicle if possible. While it can be removed, it involves some work as can be read in our article called Removing a Car Adhesive Dash Mount. It’s been one of our most widely read articles since we first published it. Second reason for a portable mount that a permanent mount is an indication to a potential burglar that you may have something worth stealing in your car. Lastly, if you live in one of those states that make mounting to your windshield illegal, a dashboard mount is a good alternative especially for anything used for navigation purposes. There are two types of portable dash mounts. The most popular are the types that have a non-skid bottom and sit on your dash and these are the most popular of the two types. Some of these are weighted like a bean bag and others are lightweight and low profile. These often work in conjunction with parts from a current mount, be it a suction cup or a GPS cradle. The second type is a new technology that combines a suction cup with a sticky gel. We will discuss both types. The Arkon GPS Friction Dash Mount is a solid choice for a weighted mount and is a good universal choice. This is a heavy mount and weighs in at roughly 1.5 pounds. The dash mount is black in color and measures 8 x 7 inches. 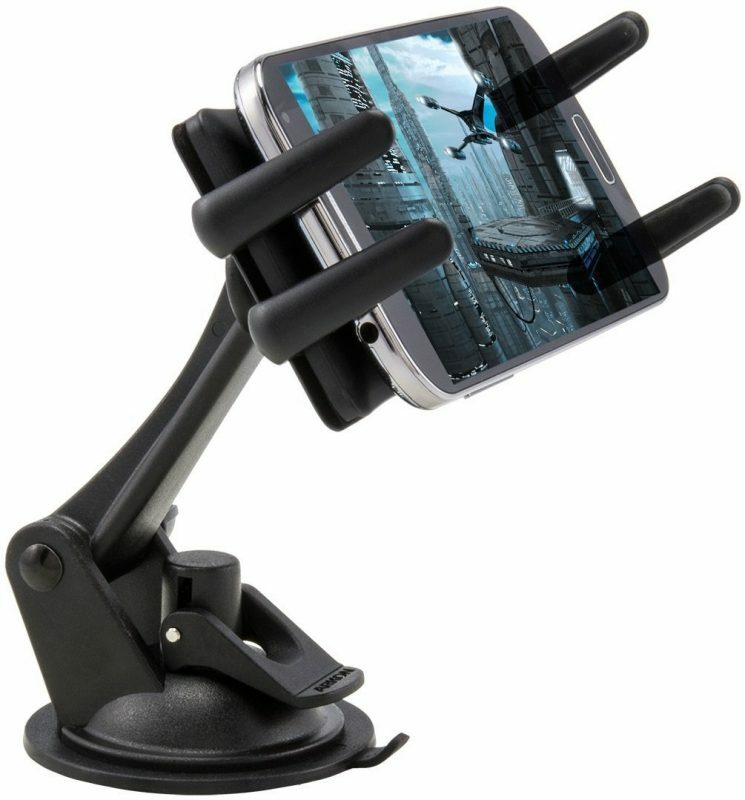 These mounts are made to work in conjunction with your suction cup mount. A feature that is unique to the Arkon Friction Dashboard Mount is the inclusion of a small safety anchor. The safety anchor has an adhesive bottom and can be placed on your dashboard. The mount itself has a small loop attached to the back of it which allows you to attach it to the adhesive safety anchor. This is a nice added feature that improves the stability of the mount during a sudden stop. Removal of the mount when using the safety anchor is simply a matter of slipping the loop on the mount off the safety anchor hook. For Garmin GPS units, a low profile option is the Garmin Portable Friction Car Mount which was introduced roughly 5 years ago. The mount weighs 6 ounces and has a non-skid friction base. A standard 17mm ball is part of the mount which fits the cradle that came with your Garmin GPS. We have found the key to using these is to ensure that the base is on a level part of the dash and not overhanging. In other words, be sure that the entire base is resting on your dash. Also be sure that your dash is not oiled with a substance such as Armor All. Using any oil on your dash will render the friction non-skid part of the mount ineffective. And lastly, place this on a level part of your dash to avoid the mount slipping off with a sudden stop. Earlier in this article, we mentioned a new type of mount that combines the best of a suction cup with a dash mount. The Arkon Windshield and Dash SmartPhone and Small Tablet Mount is an excellent choice for mounting a smartphone or a small to midsize tablet. This is the one shown in the photo that accompanies this article. The sticky suction car mount bonds to smooth and slightly textured surfaces. The sticky bottom can be recharged by simply washing it in some warm soapy water. The cradle opens to about 7 inches and can be rotated 360 degrees for landscape or portrait use. There is an adjustment point at the base allow manipulation of the height. The mount comes with an adhesive disk that can be paired with this mount if you would prefer to use that instead of the sticky base but then it wouldn’t be fully portable since that dash base would always be left behind. I could write a 10,000 word article on the topic of portable dash mounts as there are a lot of them out there. These are three mounts that I have used personally so know they are good mounts. The important thing with a dash mount is stability. Make sure it doesn’t move when in use yet easy to remove when you get out of the car.